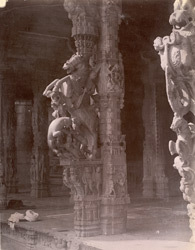 Photograph of the Kalyana Mandapa of the Jalakanteshvara Temple, Vellore taken by Alexander Rae c. 1890. The Jalakanteshvara Temple is built in the Vijayanagara style and dates from the 16th century. The complex is enclosed into high walls and is entered on the south through a high gopura. The Kalyana Mandapa is situated to the left of the outer enclosure, in the south west corner of the compound. The ceiling of the mandapa is covered with beautifully executed sculpture consisting of a large lotus with parrots hanging from it. Carved onto pillars like that shown in this photograph are some of the finest carvings of the Vijayanagara period . The outer piers are fashioned as rearing lions, yalis and horses with riders and other mythical beasts. These magnificent carvings are done almost in the round and are some of the finest examples of sculpture from any period in south India.